With equities settling lower, the VIX managed the third consecutive net daily gain, +10.7% @ 15.26 (intra high 15.96), having rebounded from a post FOMC minutes low of 13.73. 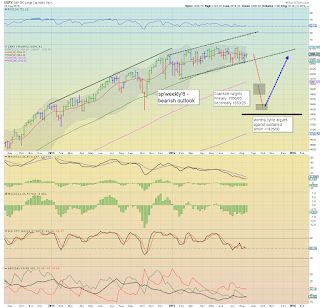 Near term outlook is for the sp'2050/40s, which should equate to VIX 17/18s. 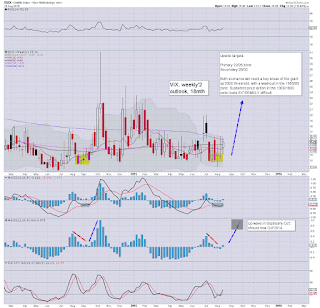 *note the bullish MACD cross on the weekly VIX... there is a very viable 4-6 weeks upside from current levels. Despite closing a fair way below the morning high, the VIX still closed decisively above resistance of the mid 14s. The 17/18s look due before the weekend... but it does remain highly doubtful that we'll see the 20s in the current up cycle. Closing minutes... distinct weakness... as the rats made a run for it! It was one hell of a day.. with morning weakness way beyond what I thought possible ahead of opex. The bounce into early afternoon was natural.. but the hyper-spike to sp'2096 was indeed crazy.. and not sustainable. 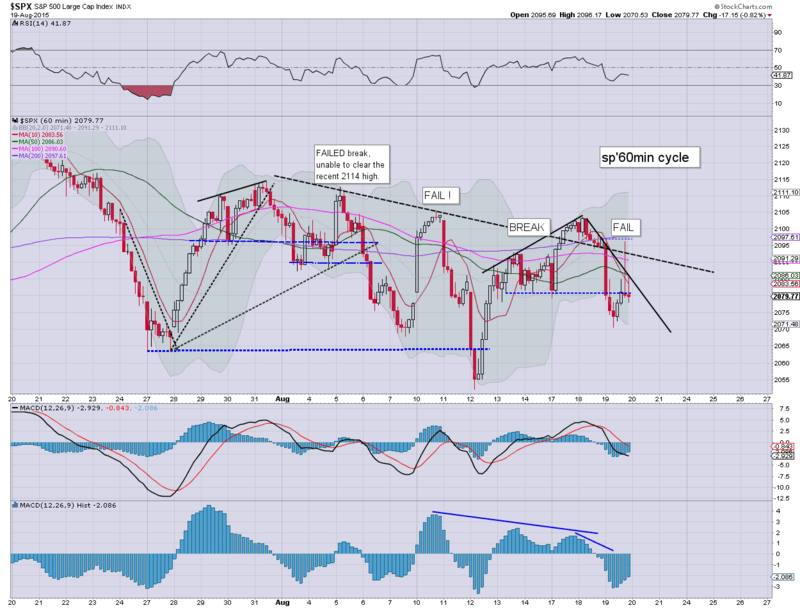 As for tomorrow... the daily close (including US bonds) is suggestive of downside. 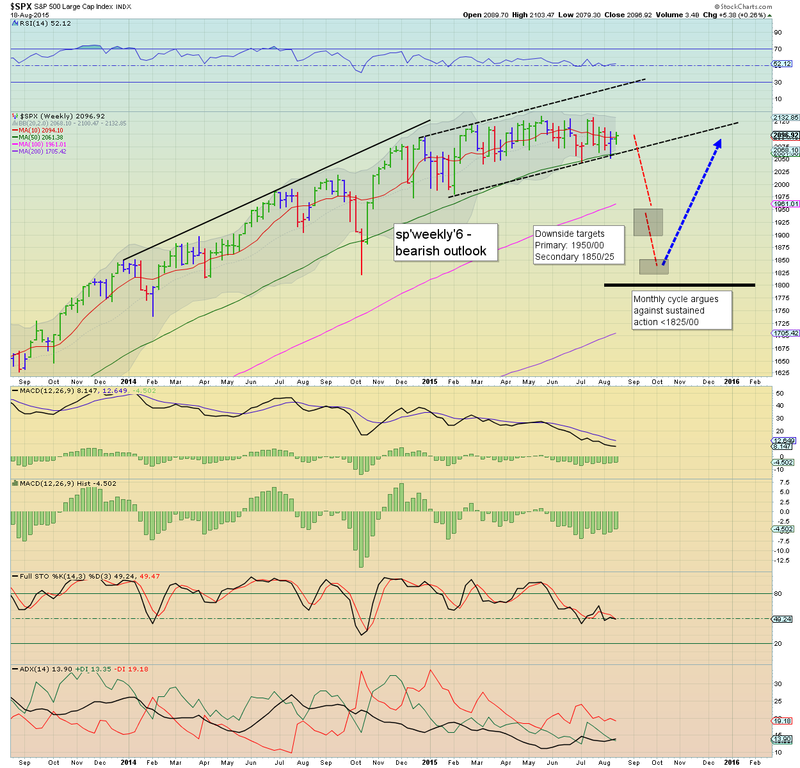 Yet.. it is opex week, and there is threat of upside to the sp'2100 threshold. *I hold long-VIX.. and short-AAPL (the latter is a first for me). US equities saw a hyper short-stop cascade on the FOMC minutes from sp'2080 to an afternoon spike high of 2096 - filling the micro opening gap. However, Mr Market now seems intent on renewed weakness into the close... and unlike the crazy reversal last Wednesday, the indexes are set to close negative. *I highlight the VIX daily 'rainbow' chart to again note resistance in the mid 14s. We have a rather exciting closing hour ahead! *I hold long-VIX.. and short-AAPL... overnight. 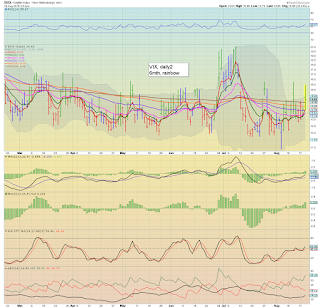 Seeking the sp'2050/40s.. with VIX 17/18s... whether that comes before the weekend.. or next week.. I don't much mind. 3.38pm... chop chop... sp'2081.. with VIX 15.00s.... all things considered.. that is fine for those currently short. It appears Bloomberg have already released the FOMC minutes.. and the market has duly seen a micro spike higher. 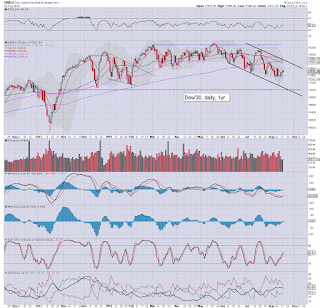 Now it remains a case of whether the sp'500 closes below the 200dma (2077)... along with VIX 15s. *I am standing by to pick up a sig' AAPL-short position... in addition to my VIX-long. Will look to hold both overnight.. and probably into late Friday. Anyone long... getting opportunity to exit... anyone not already short... getting opportunity. US equities are seeing a natural intraday bounce from a morning low of sp'2070 (with VIX 15.96). Once the FOMC minutes are out of the way, the way is clear for the equity bears into the weekend. 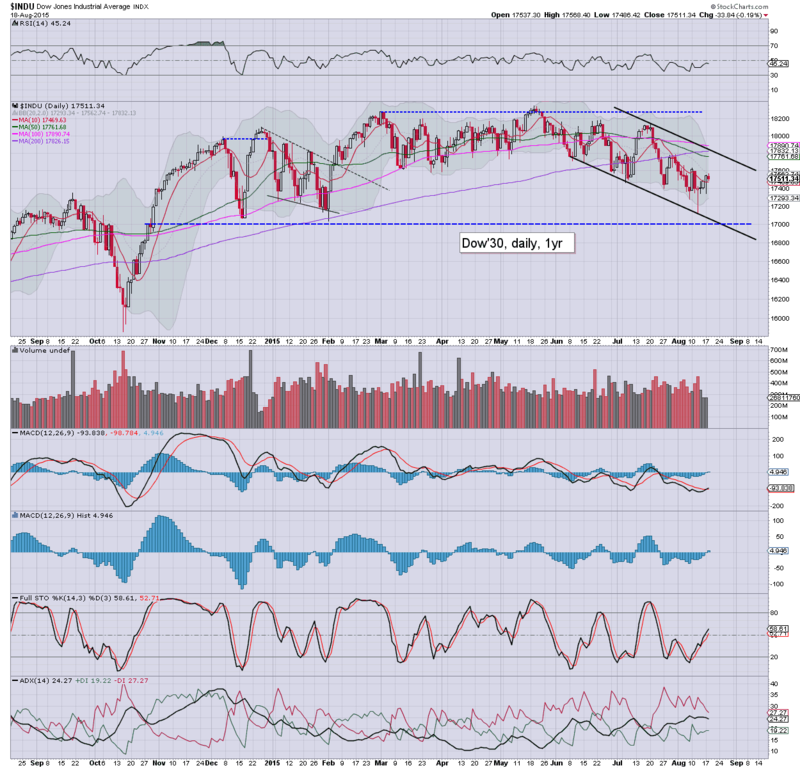 Primary downside are the sp'2050/40s, with Dow 17000, and that should equate to VIX 17/18s. Standing by to get involved after the FOMC mins at 2pm. The US market is unravelling, with a decisive break below the 200dma (2077), along with VIX in the upper 15s (well above resistance of the mid 14s). Now it is a case of whether the bears can keep the pressure on.. and close <2077.. .along with VIX 15/16s. Well... I was not expecting a break this side of opex... frankly.. its a bonus. There is of course continual threat of a bounce... and I will merely add on the short-side.. on any such bounces. *I hold long-VIX.. seeking the 17/18s within the next day or two... which should equate to sp'2050/40s. 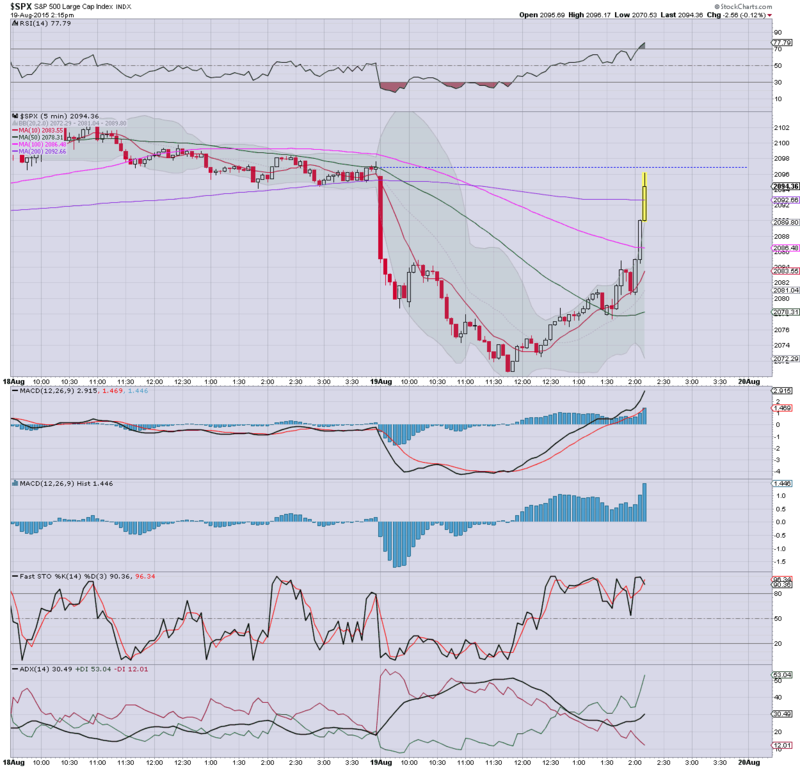 Whilst the sp' has already broken back into the 2070s, the real notable action is arguably in the VIX, which opened above key resistance of the mid 14s.. and is now +13% in the 15.50s. 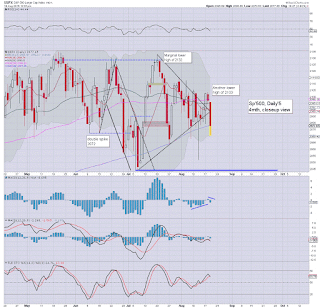 With the break above resistance, the equity bulls are in trouble, with threat of VIX 17/18s by the weekly close. *the equity bears still face the FOMC mins' at 2pm.. which does threaten a bounce... however, the 2120s now look out of range. Well, its starting to get real interesting.... the recent low of sp'2052 is now within range for tomorrow or Friday. 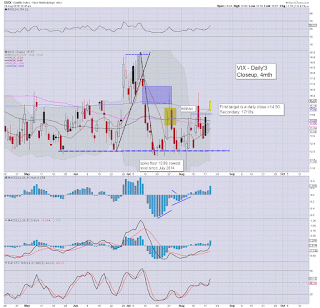 VIX is above resistance.. and battling for the upper teens. Frankly.. its looking rather good for the bears... but as ever.. 11am is often an intraday low.. so.. for the day traders out there... some caution would be useful. 11.22am.... a clear break of the 200dma.... to sp'2074... now its case of whether we close <2077. VIX in the 15.60s...a break into the 16s would be useful..... 17s look a stretch today...... far more likely tomorrow or Friday. 10am update - are you hearing alarm bells yet? Regardless of what happens across the rest of today, it should be rather clear to those with eyes on the bigger weekly/monthly cycles.. this market is looking very strained. 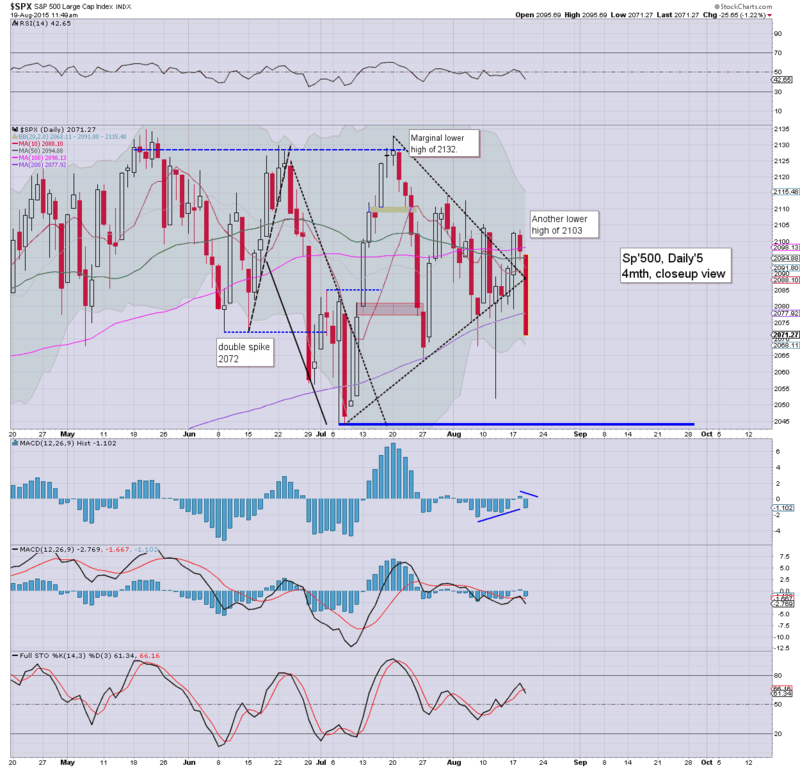 A significant break lower looks due... first near term target remains Dow 17k, with sp'2040s... and VIX 17/18s. 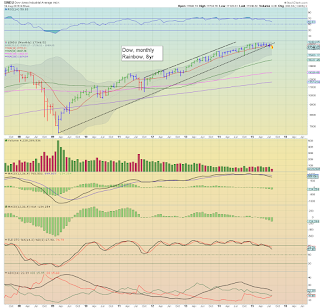 *note the red candle on the Dow monthly, having been flat lining for months. 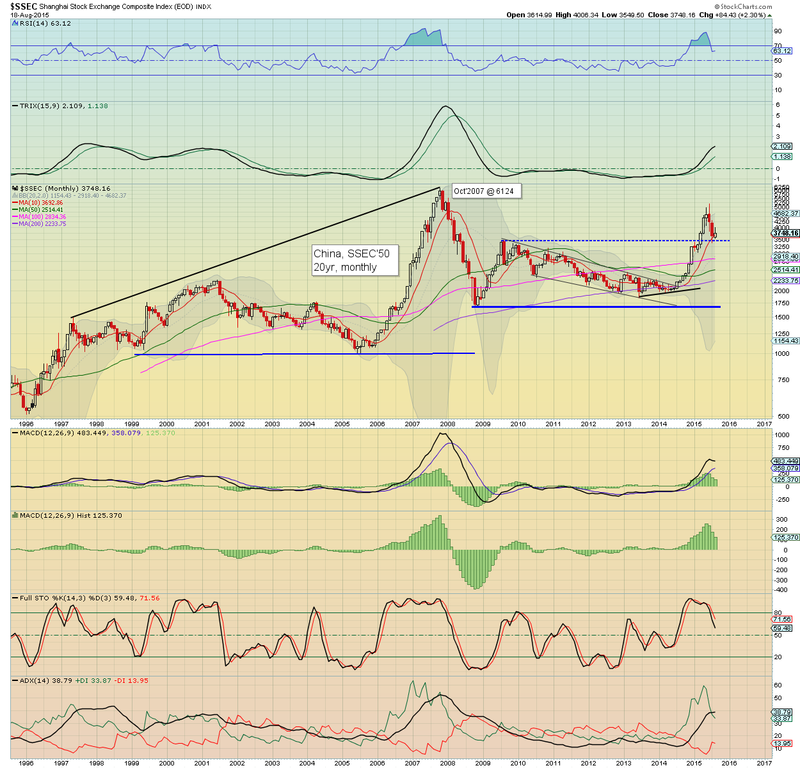 It is opex week, and I remain of the view, that the bears will have a far better opportunity next week.. into end month. 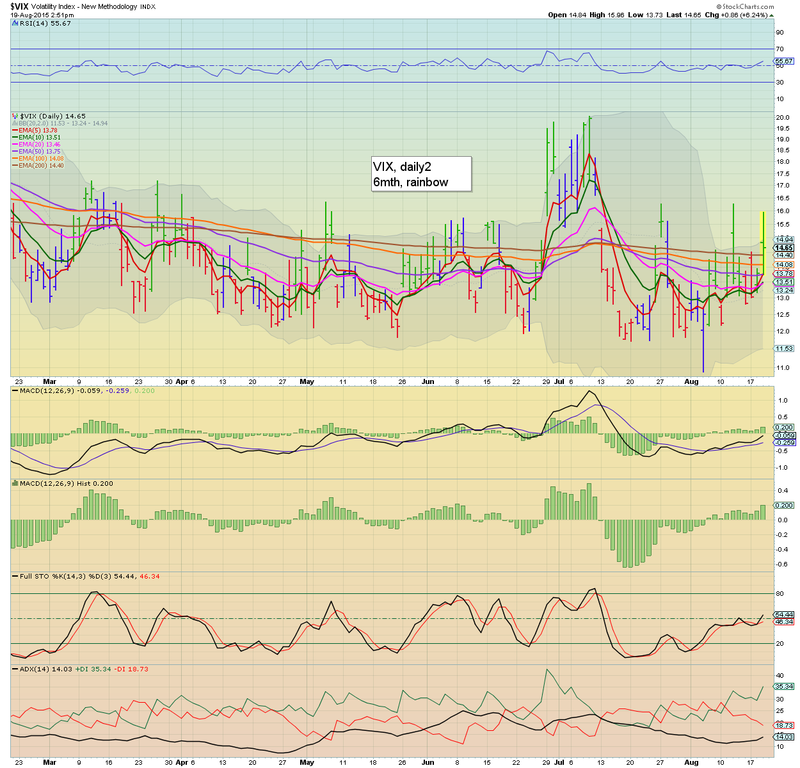 A daily close in the 2070s.. with VIX 15s will give clarity of next week. 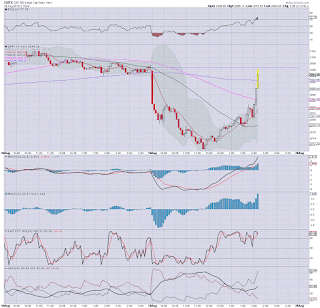 notable weakness: TWTR -2.6% in the $27s... those seeking the 30s will be waving the white flag about now. 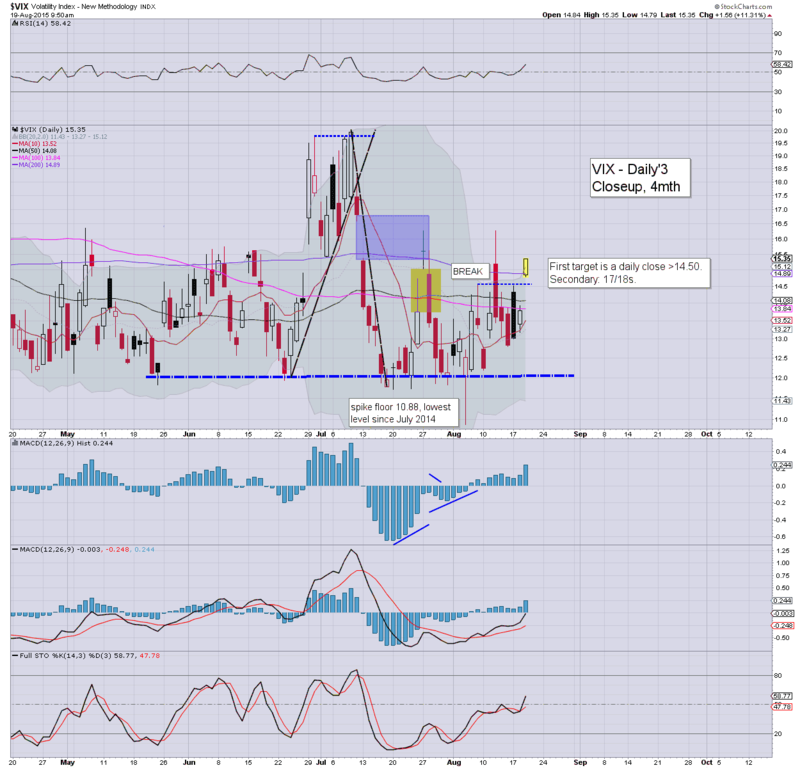 ... yours.. LONG-VIX... but also looking to pick up another short position on the next 15/60min cycle bounce. Seriously though... we're set to go lower, yes? 10.03am... the 200dma @ 2077... a daily close under there.. will offer the bears weakness into the weekend... something even I was resigned as not viable. FOMC mins' due at 2pm... that really is the one hope bulls have for latter day upside... but having already broken to sp'2078... its looking tough. Anyone still expecting 2170/2200s ? 10.22am... chop chop... sp'2082.. with VIX in the low 15s. Point stands.. we have a VIX now trading above resistance (although yes.. that was the case last Wednesday, and VIX sure didn't close positive)... along with a marginal new low of sp'2078. 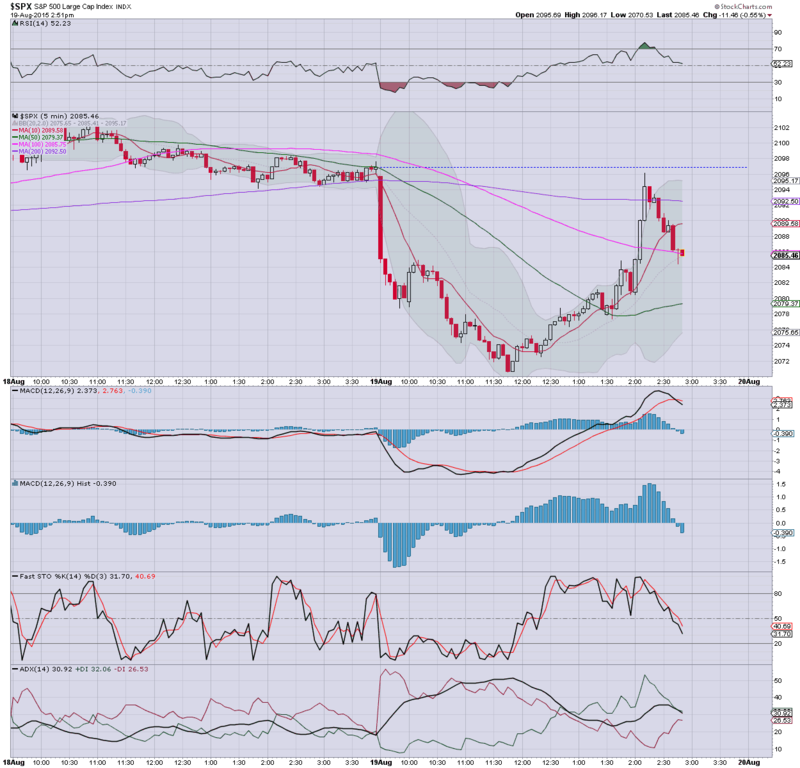 So.. for the moment I'm content to hold VIX... seeking 16/17s.. 18s would be great. However, I'm also looking to get more involved... more short-term positions. In terms of options.. I'll be trading via Oct' month... which should offer enough time on the detonator clock. 10.32am... Oil inventories... +2.6 million barrel surplus... Oil breaking lower, -1.5%.. and that is not going to help the energy stocks. Good morning. After further China upset, equity futures are moderately lower, sp -4pts, we're set to open at 2092. 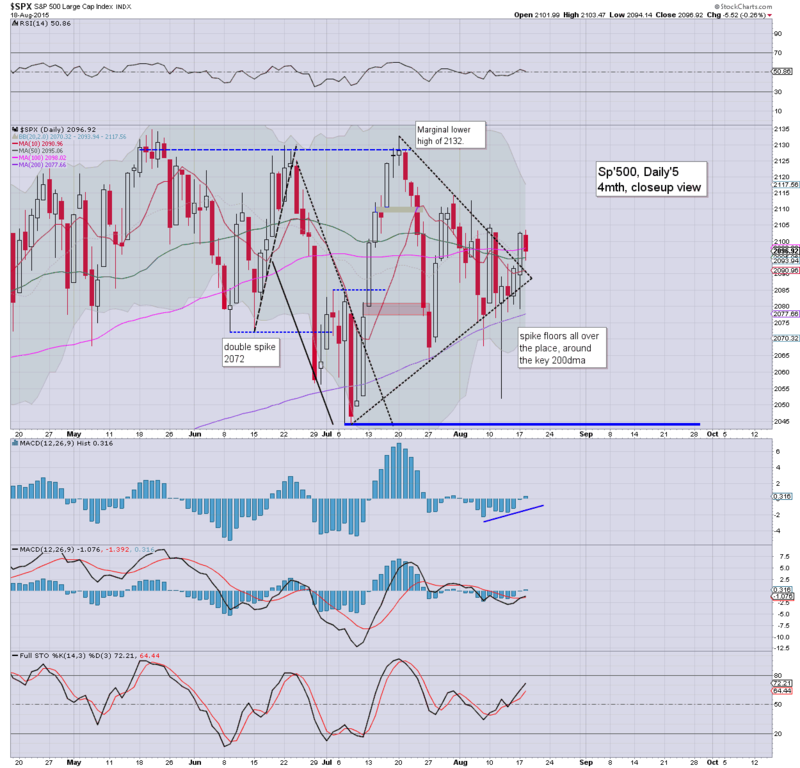 Mr Market is looking a little vulnerable today, but a daily close <2080 looks unlikely. 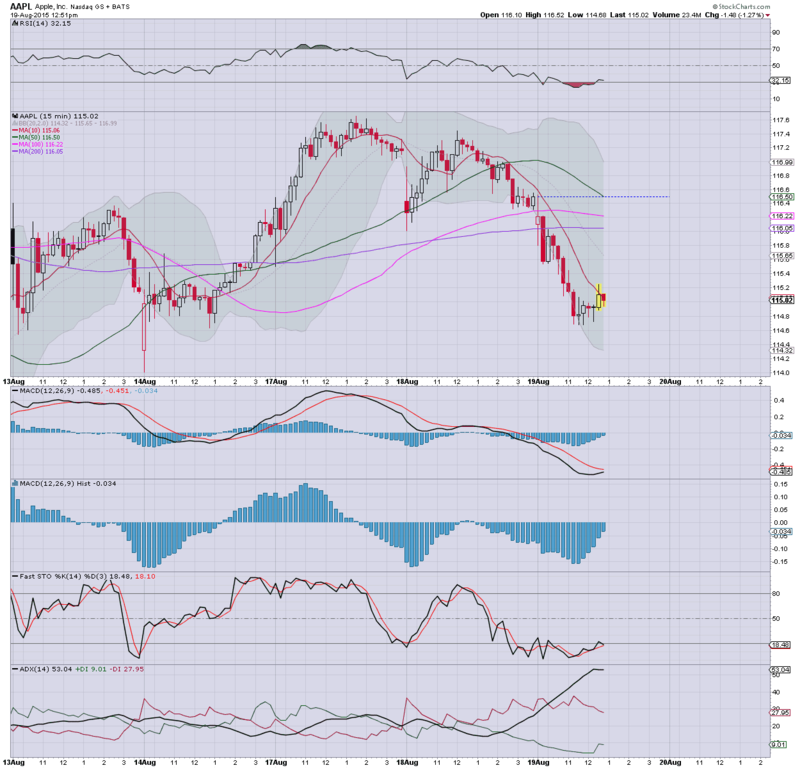 Sig' downside action looks viable after opex is out of the way. So.. a little weakness (ahead of CPI data)... and we will probably be trading in the 2080s this morning. As noted yesterday, until I see sp'2070s - along with VIX 15s, the equity bears can't get overly excited. 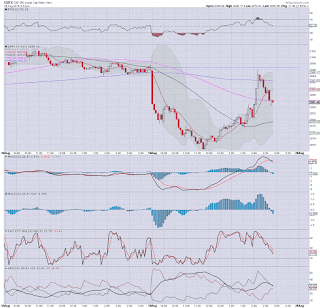 There remains threat of another lurch higher into opex Friday. *I am looking to pick up another short position in the immediate term. As regular readers will be well aware... I am particularly bearish AAPL, DIS, and INTC. All have seen decisive breaks this summer, and look set for lower levels. 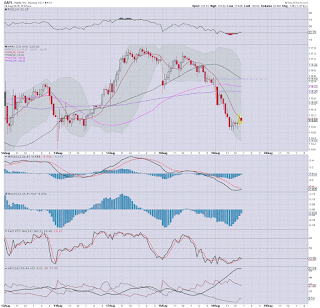 Of the three, I'm inclined to short AAPL, with an initial target of $105. By definition, that would equate to sp'2000... if not lower. Indeed, the pattern from summer 2011 is similar to what we've had since February. 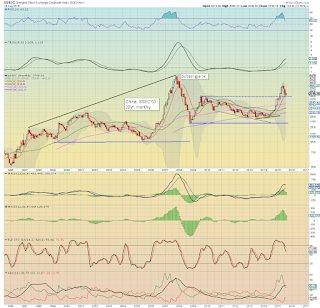 Are we looking at forming a marginally lower high, before a powerful 10-12 day collapse wave... to the low sp'1900s? Overnight China action: renewed weakness, with a morning low of 3558... but then the PBOC were buying again.... with the Shanghai comp' settling +1.2% @ 3794. 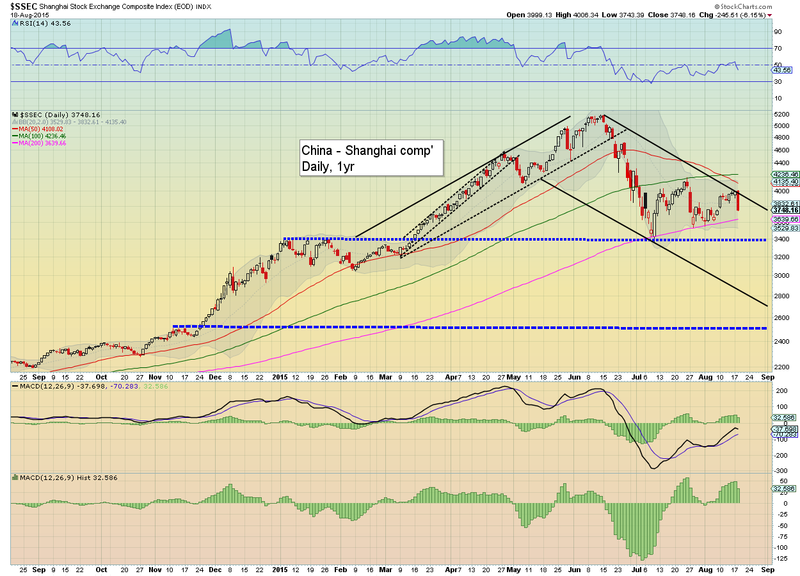 Despite the continued intervention.. the 3200/3000 zone remains on track. 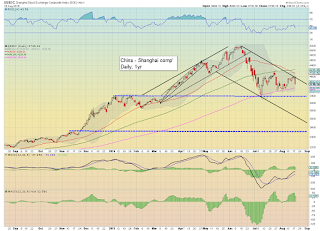 It would seeem all the PBOC can do is periodically negate some of the down moves. They can't stop all of the selling. take out food/energy (yeah... that figures)... +1.8%... relatively close to PRINT HQ target. 8.53am.. Eyes on the VIX at the open... as its August settlement. From there.. until we're >14.60.... equity bears can't get excited. 9.11am.. indexes cooling, sp-7pts.... 2089... that should equate to VIX opening in the 14s. If VIX can just break >14.60 (to be decisive)... it'd be suggestive equities will unravel from here.. despite the usual inclination for mod' upside/churn into OPEX Friday. 9.32am VIX opens in the 14.80s.. ABOVE resistance... things are starting to get interesting! With the Shanghai comp' unable to break and hold above the big 4K threshold, the Chinese equity market is starting to unravel again. First downside target is the 3200/3000 zone.. and considering a fair number of huge one day drops since the June high of 5178, the low 3000s look viable within the next few weeks. Suffice to say.. all those recently calling a multi-month floor of 3373 should already be concerned that the SSEC has been unable to break and hold above the 4K threshold in recent days. Despite the dozens of measure the Chinese leadership have desperately taken... the market continues to attempt to still make its way lower. The next few months should offer a capitulation low.. and then renewed hyper upside. Wed' will see CPI (8.30am), the latest EIA oil report, and the FOMC minutes (2pm). That will be plenty enough to keep most awake!. So.. a daily close of sp'2096.. with VIX in the upper 13s. A few more days of moderate chop look probable. Yours truly (being somewhat impatient last Wednesday).. remains long VIX from the 14s. I think the mid/upper teens are a given by end month... and frankly.. that will suffice for my next exit. 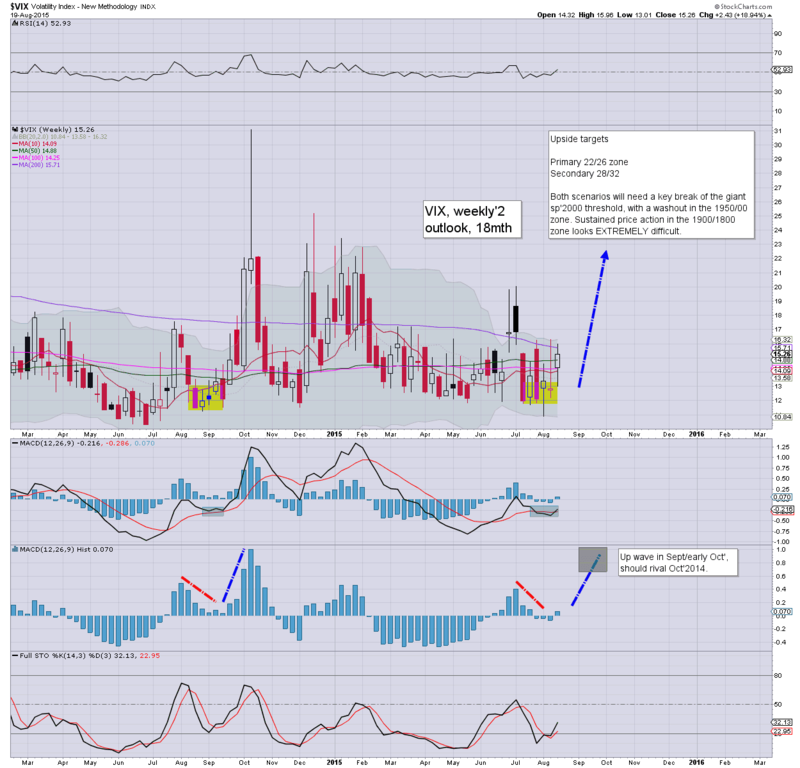 On any fair basis, VIX 20s look likely in Sept', but how high might the VIX spike... difficult to say. US equities closed moderately weak, sp -5pts @ 2096 (intra high 2103). The two leaders - Trans/R2K, settled lower by -0.2% and -0.8% respectively. 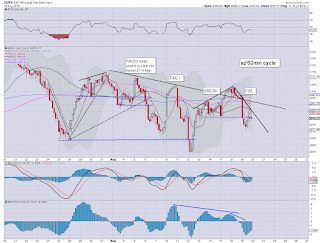 Near term outlook is mixed, with viable upside to sp'2110/20s.. before significant downside after the next opex. Price action since the historic (if fractional) new highs in mid May remains very choppy... and somewhat on the weaker side. 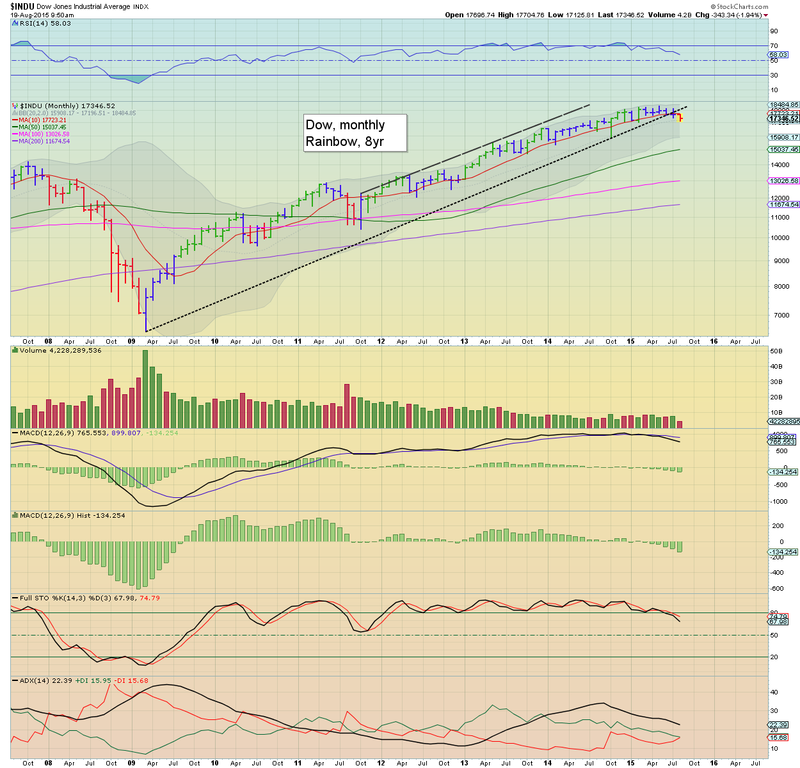 First key downside is Dow 17000, and that should equate to sp'2000.. along with VIX 18/22 zone.